So you have been a saree fan for quite some time and built a trousseau with the loving contributions from your mother, aunts and cousin that would befit a queen-but a year into your happy married life, and you come to know that those gorgeous sarees will now have to be discarded, albeit temporarily as you have got pregnant! This is perhaps the trajectory in the eventual life of all married women who face the verdict of a belly bump, and suitably adding loads of pounds on themselves. For some it’s the joy that overwhelms them for some time till time passes and the belly begins to show all the right signs of growth, and then comes the rather sticky situation-what does one wear, when the abdomen begins to show such a huge and hurried growth? How does one begin to rethink saree wearing, or is there no other option but to begin wearing other more ‘suitable’ kind of clothes. What about women who love those nine yards of magical weaves that acts more like therapy for their souls? So, if you are not quite fond of the maternity clothes all seem to be suggesting you should be wearing and if there is wedding round the corner- and you have reached your third trimester and unable to quite hide your bump any more-what should you do? Comfort is perhaps the most important aspect of taking your pregnancy easy- and not only is it important for the soon to be mother but also the health of the baby. Thus the usual concerns while wearing a saree during pregnancy is surrounded by the myth that the petticoat would not be too tight on the belly or that one should not expose the belly – or the constant fear that one might trip over the low edge of the saree border. All these concerns are valid and can be easily addressed. While most of these fears are unfounded as women in the past managed pretty well without the new age maternity clothes. It is being comfortable in the fact that showing your belly and your weight is as natural as breathing and wearing a saree , if it comes naturally to you should not be discarded. 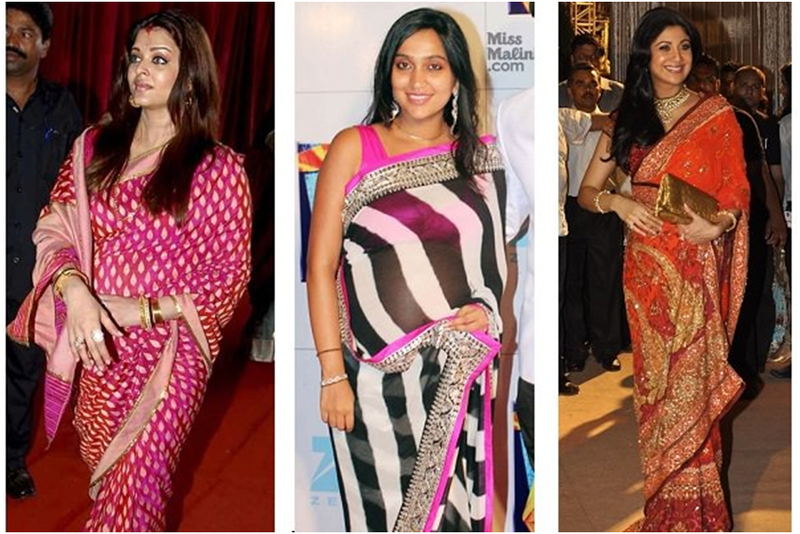 Here are some simple and very easy means to ensure that your saree wearing during pregnancy is as easy and relaxed as always. Yes-the foremost task is the choice of the right fabric for the saree you wish to wear-keep them closest to cool cottons and fabrics that breathe easy. Steer clear of synthetics and any fabric that tends to get entangles in your legs –as do synthetics and crepes. The lighter and more airy the fabric, more relaxed you would feel in its folds. In case there is a special occasion coming up needing some kind of heavy saree wearing –make it a heavy Chanderi rather than a Uppada or Kanjeevaram. Also do a trial run at home for at least one hour. Wear it round the house, move around and see hwo long can you remain fine wearing it. Try not to wear any tight string on the belly and rather switch to an elastic band that is slightly wide but not tight. 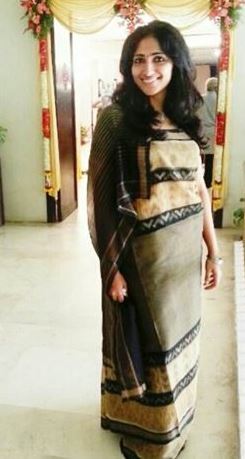 This will help you tuck in your saree with ease as well as ensure that you do not get unsightly marks. Whether one believes it or not, since sarees keep our skin more exposed, wearing it will automatically ensure that we take better care of our skin and so we will massage it more regularly and that helps eventually in keeping our skin healthier during pre natal period. While draping your saree remember that the pleats have to travel across the bump and thus should not end above the ankle .They will be too short in length if you keep it at the same length as usual if you do not take into consideration the bump. Since one is not going to be wearing heels it is prudent that one wears the saree just till the ankle level and not below. Wearing flats will make sure that there is no danger of entanglement. As this does not make imperative any pleating and uses folds-makes it an interesting traditional option. Again the kid that will allow one to camouflage the belly with ease with the pallu.nAs you can see in the picture below that Aishwarya managed to go to the most glamorous of world events wearing a saree with great aplomb. 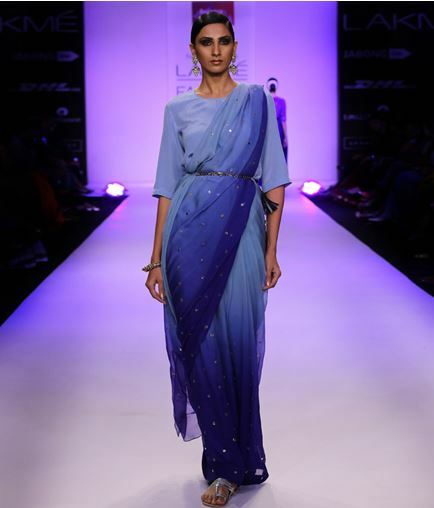 The drape across the upper torso is such that the belly is conveniently hidden and the pallu is brought to the front from the back. 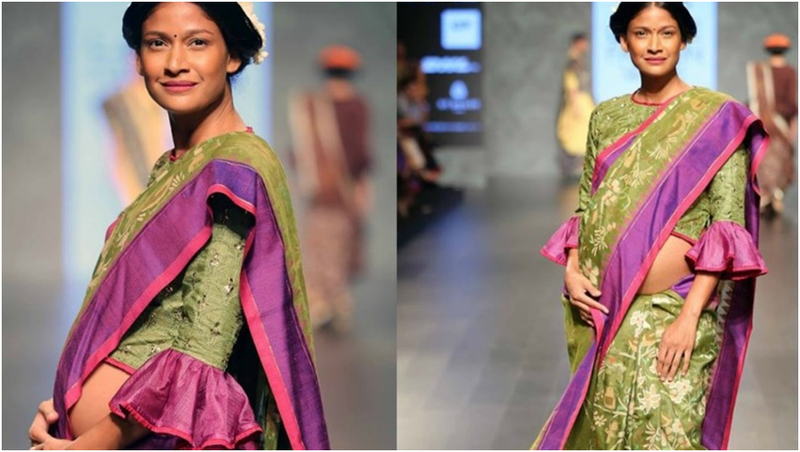 The folds of the saree and the manner in which the skirting of the midriff happens makes it the best and easiest way to drape during pregnancy. The blouse too can be different designed-I would simply go for the jacket style blouse or those with airy loose sleeves that allow your skin to breathe. Go for diaphanous sleeves if that makes you more comfortable. The period of life that is the most joyous should not be spent wondering if one is looking attractive enough-in fact it must be spent knowing that one is nothing less than the diva you always have been!